Secretary of State for Transport Chris Grayling is on a two-day "trade trip" to Qatar, which owns 20% of Heathrow Airport, followed by a day in Turkey. He'll be hoping that the newspaper journalists covering the biggest rise in UK rail fares since 2013 will have moved on to another story. This seems unlikely as Lord Adonis has been calling for Grayling to resign for using hundreds of millions of taxpayers' money for what he sees as a bailout. Virgin Trains East Coast, a partnership between Stagecoach and Sir Richard Branson's Virgin, had previously agreed to pay the Government £3.3 billion to run the service until 2023 but the companies have been allowed to walk away from its franchise three years early. 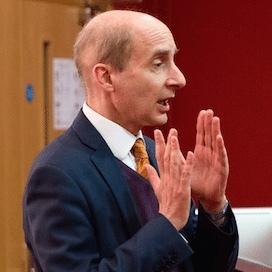 SHE is not a fan of Lord Adonis, who was dubbed a village idiot last February when he referred to the massive proposed third runway development that would destroy thousands of homes as "a piece of tarmac". He could not understand why the country had found it difficult, over the decades, to agree to a piece of tarmac! It is curious that "village idiot" Adonis is now accusing Grayling of "sheer stupidity" over his handling of the railways. They seem a well-matched pair. Adonis thought the runway was tiny and people shouldn't stand in the way of a little bit of tarmac. Lord Adonis resigned from his role as Chair of the National Infrastructure Commission on 29th December after spending Christmas skiing in Austria. He has claimed that the Government threatened to stop co-operating with him when he attempted to expose the East Coast fiasco. If so, he appears to have had little option but to resign before he was sacked. — Virgin Boss Richard Branson's Tweet on 1st Jan - While living on his own remote island he promotes a third runway, which would ensure thousands of people have their sleep disturbed by aircraft noise.